People with Type 2 diabetes, as a population, are twice as likely to develop certain types of cancer when compared to individuals who do not have diabetes. 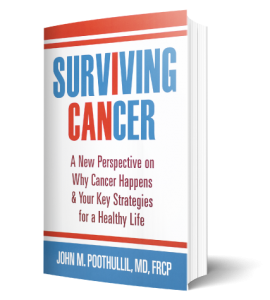 Today I am announcing that my newest book will soon be published — Surviving Cancer: A New Perspective on Why Cancer Happens & Your Key Strategies for a Healthy Life. You know me from my two books on diabetes. As I have written, I have devoted more than twenty years to the study of Type 2 diabetes, seeking to understand its true root causes and the ultimate way you can reverse your diabetes. My study of diabetes actually led me to also investigate cancer. One main incentive is the fact that diabetes and cancer are highly correlated. I have therefore dedicated several more years to the study of cancer and my goal is to help as many people with cancer as possible learn how they can survive if they have been diagnosed with a solitary cancer. Surviving Cancer will be published on November 15, and I will be pre-selling the book starting 11/1 on Amazon. If you have cancer or know someone who does, this is an important book that could transform a life. I invite you to read an excerpt of the book in the rest of this blog. “FEAR. Fear is what most people feel upon receiving a diagnosis of cancer—and perhaps you are experiencing it. The capacity to feel fear is an integral part of human nature, but so are adaptations that allowed our ancestors to survive life-threatening situations for tens of thousands of years. HOPE. Hope is my objective in writing this book, to share with you that it is possible for most people confronted with the prospect of dying from cancer to lessen the degree of threat that cancer makes on their life. There are real actions you can take to prevent yourself from dying from cancer. If reading this book reduces the intensity and duration of your cancer-related anxiety and fear, I will have accomplished my minimum objective in writing it. In a nutshell, you will learn that if you have been diagnosed with a solitary cancer, such as a tumor, it may cause symptoms due to its location or size. But in a vast majority of cases, a solitary cancer can be treated, or removed. It is when that cancer releases thousands of cancer cells that roam all parts of the body, scouting for suitable locations to start their own housekeeping that makes cancer life threatening. If even just a few succeed, they can create enough disruption of metabolic processes in the body to endanger life itself. They do so by confiscating nutrients your normal cells need to sustain themselves, not just in one site but in multiple parts of your body. As the cover of this book shows, we have to think of cancer as an iceberg in the ocean and you are a boat approaching it. One can’t know the true size of the iceberg by looking at the top of it. You can only see the portion above the water, and what is beneath the sea is usually far larger. Similarly, one can’t know how long a cancer has been in existence when it is detected; it may have been growing for years, if not decades. One can navigate around a solitary iceberg once the location and the direction of the iceberg’s movement is known. More often than not, one can survive a solitary cancer once the location and size are known. But the chance of an accident increases when one has to navigate around multiple icebergs. In the same way, when the number of cancers or cancer sites in the body is increased, the chance of survival is reduced.